Fun in the Sun" summer program in the region and presented the 2010 Caracoles Festival to the public with a sampling of the creative marine-life inspired dances by the Mugnapak Dancers. Regional Tourism Council secretary Araceli Ayuste said Samal Island is cashing in on the summer heat made more unbearable by the El Nino phenomenon by offering more than their cool, white sand beaches. This time, Ayuste said tourists are expected to get enamored to Samal Island from sundown to sunrise through the Caracoles Festival which is usually being held during the last Saturday of April. "This is already the third ‘Fun in the Sun’ for the region and this should send a positive signal to the public that all tourism destinations here are ready to provide them with all the fun they can get under the sun,” Ayuste said. Ayuste said the highlight of the "Fun in the Sun" program is the Caracoles Festival which will be back to Samal Island after being held at the Sta. Ana Wharf in 2009. This year’s festival celebration will be held specifically at the Penaplata Elementary School in Samal Island and the fun begins at 6 p.m., she said. 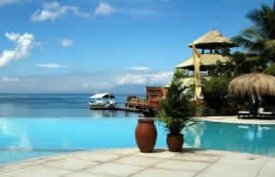 “We expect the Caracoles Festival as well as the overall ‘Fun in the Sun’ program to bring in lots of income for establishments in Samal Island,” Ayuste said. She encouraged everyone who wanted a taste of island living to join them for the Caracole Festival as it is guaranteed to be a non-stop party for the guests. She said the program is a continuation of the five-day Gulf Dive so it is expected to be a pretty long summer holiday for those visiting Samal Island. But even those who just want to stay overnight without checking in on one of the resorts can still enjoy the Caracoles as they don’t need to sleep all night.